Lexicon reverb in a plug-in - do we really need to say more? Amazing sound. Easy to use. Loads of expertly-crafted presets. Replaces Lexicon hardware. The price! Presented as separate plug-ins. 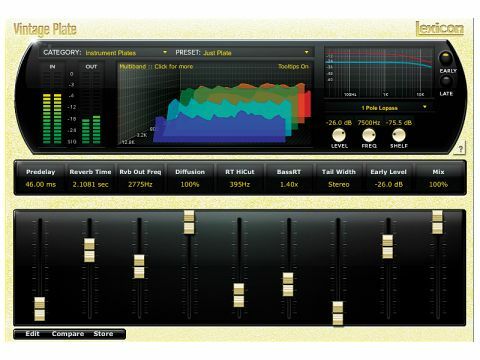 Lexicon hardware units take pride of place in many pro studios, and over the company's 39-year history it's become the gold standard in digital reverberation. Indeed, whenever a reverb plug-in is reviewed, if it's very lucky, it might draw comparison with that lush Lexicon-esque sound'. The company has made tentative forays into software over the years, notably with the Lexiverb back in 1999 - a major complaint with that one being that it simply didn't sound much like their mega-priced hardware boxes. The PCM Bundle utilises the algorithms and presets from the Lexicon PCM96 hardware reverb (the exception being the Bundle's Vintage Plate, which is an amalgam of unspecified Lexicon 'verbs). Buying one of these units will set you back over £2000, so thinking logically, the PCM Bundle o­ffers better value for money at around half that. And an obvious boon of the software format is you can run as many plug-in instances as your system can handle, rather than being limited by the restrictions of the hardware - you can only run two stereo reverbs at once using the PCM96 in FireWire plug-in mode, and just one standard stereo conf­igured e­ffect using its analogue connections. For those who can see the value in Lexicon hardware, the PCM Bundle makes a great deal of sense. It should be noted that the PCM Bundle doesn't o­ffer all the e­ffects of the PCM96 - while the reverbs are very much present, the other e­ffects (delays, pitch, modulation, etc) are nowhere to be found. This is no massive loss in the great scheme of things, as most people will want to buy the PCM Bundle for one thing only. The PCM Bundle comes in VST, AU and RTAS formats, uses iLok dongle protection, and has a straightforward installation procedure. As its name implies, this isn't a single reverb plug-in, but a suite of seven visually identical ones, all using the same clean GUI, which resembles a Lexicon PCM96. Each plug-in's name denotes the Lexicon reverb algorithm that it uses, these being LexVintagePlate, LexPlate, LexHall, LexRandomHall, LexConcertHall, LexChamber and LexRoom. The PCM Bundle plug-ins are easy to get a handle on, taking a direct and professional approach to the controls, with functionality being the key. From left to right, there's the customary in/out metering, a real-time display and finally an EQ display. These are underscored by a set of nine faders collectively termed the Soft Row, and these react in a pretty 'realistic' way when manipulated, with some pleasing inertia to their movement. The Soft Row offers up the most commonly adjusted reverb parameters, such as predelay, decay time and the obligatory dry/wet mix. Click the Edit button at the bottom left and a submenu appears, revealing more detailed settings and advanced parameters for the particular plug-in you're using. Plumb in the plug-ins on auxiliary channels and top-drawer reverb sounds are had immediately, all without delving into the more detailed edit menus, which is testament to the design of the presets and, of course, the sound quality. The 950 presets built into the Bundle impress right away - each named preset has five sub-types, which can really speed up a session when the dreaded "the same… but a bit different" request arises. The sub-presets typically offer EQ changes or other tonal tweaks and are named accordingly - eg, Dark (high-end roll-off), Notch (midrange 'V' cut) and so on. While plug-in reverbs were once poor relations to hardware, there's been a proliferation of high-quality in-the-box examples over the last year or so and, indeed, several that we've described as having a Lexicon-esque sound. So now that the PCM Bundle is here, where does it sit in relation to its contemporaries? Comparing the Large Hall preset from the LexHall to similar-sounding presets on the SSL X-Verb and 112dB Redline Reverb is interesting indeed, particularly considering that both of these competitors seem to owe much of their design and sound to Lexicon units. In fact, comparing is something of a headache, as sound quality-wise, it's hard to pick a winner - they all do luscious, polished reverbs to a T.
"Ultimately, what you're paying for with the PCM Bundle is the fact that it's unarguably the 'real thing' rather than merely an attempt at a Lexicon-style reverb." Each unit has strengths: Redline, price; X-Verb, usability; PCM Bundle, presets. That the PCM Bundle's presets have the upper hand comes as no surprise, seeing as they're derived directly from those of Lexicon's highly successful hardware. If pushed, we'd say the Lexicon is sweeter-sounding than Redline Reverb and more professionally put together than both. Ultimately, what you're paying for with the PCM Bundle is the fact that it's unarguably the 'real thing' rather than merely an attempt at a Lexicon-style reverb - it goes without saying, then, that it sounds incredible! The bundled nature of this package does present a few issues. Selecting the right plug-in (and hence algorithm/model) for a given task is hit and miss at first, and until you're familiar with the sound of each, you could be loading and closing the different plug-ins over and over. It's strange that the PCM Bundle isn't presented as a single plug-in with selectable algorithms, thus operating more like the PCM96 on which it is based. Minor complaints are that there's no Ctrl+click shortcut to return a control to its default state, and that the PCM Bundle doesn't support MIDI control (although you can always automate it using your DAW). Also, many potential users may feel aggrieved that Lexicon have not announced plans to split the PCM Bundle into more affordable chunks. So that's the PCM Bundle - it's finally here and Lexicon has given us a classy software reverb that sounds just as good as its fabled hardware. With such a hefty price tag, this plug-in collection is clearly aimed at pros, many of whom will relish the opportunity to replace their Lexicon box with a plug-in equivalent. Considering it contains the exact same digital algorithms, there can be no disputing that what you're getting is a virtual PCM96, and we'll no doubt be seeing a rash of real ones popping up on eBay in the coming months. That may be all you need to know!